The East Neuk is a paradise for foodies, with some of the best seafood in the country on its doorstep. Don’t be fooled by its size – there are more great eateries in this area per square mile than in most parts of Scotland. Your first stop has to be the Seafood Restaurant in St Monans a local favourite for 17 years. It serves sumptuous seafood in chic surroundings and is always packed with natives and visitors alike. If you like your holiday cottage cosy, modern, spacious and clean, but full of character, look no further. 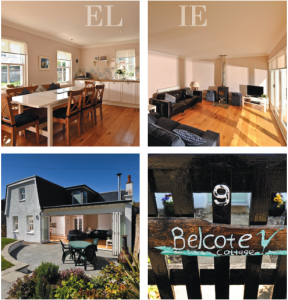 Elie Cottage is 150 years old and has recently been refurbished to a very high standard, with ample space for families and great amenities, from a cosy wood-burning stove to a ping-pong table. Sleeping eight in four bedrooms across two floors, it’s the perfect base from which to explore this pretty town. Elie has been a favourite weekend spot for well-heeled Edinburghers for generations so it’s geared up for visitors with exacting standards. From restaurants to accommodation, good service and a boutique atmosphere come as standard. The luxury at Elie Cottage is in its simplicity and efficiency. It is boutique self-catering at its best, with modern fittings, bright, chic décor and creature comforts at every turn, not to mention enough space to easily accommodate large groups. Elie sits on the Fife Coastal Path so it’s great for walkers. If you’re not looking for anything too strenuous, park your car at nearby Crail then take a walk along the coast to the spectacular gardens at Cambo House . The Victorian walled garden is spectacular year-round, and a must for families. It has the largest specialist snowdrop collection of spring, while summer sees the garden transformed into a riot of colour. Children will love the six pigs that root around the garden while adults can try one of the many classes on offer (we were dying to have a go at dry stone walling). E lit our paper lantern and watched it drift over the firth whilst darkness cloaked the Lothian hills to the south. In a straight line Elie is only 15 miles from our Edinburgh home but as my daughter Ava and I stood on this deserted East Neuk beach and gazed into the night, we were in a world of our own.Elie has been popular since the railways brought the well-to-do to this beautiful corner of Fife, and the Victorian mansions are still coveted. You can see why. This stretch of the east coast cannot boast the towering scenery of the west but has prettier towns and just about the best climate in Scotland. In summer it is packed with day-trippers and holiday-homers.Property is at a premium in the warmer months but if you want the mile-long beach almost to yourself go earlier or later in the year. We were in the newly-renovated Belcote Cottage, which can sleep up to 10 over two floors. All bare wood and quality fittings: for my wife it was property lust at first sight. The kitchen/living room opens on to a secluded garden, which leads down to the beach. The main living space also boasts a wood-burning stove, so if the weather is chilly just get the thing lit, open a bottle of red and cosy up.The town has become a foodie haven and stores like the Elie Deli and Ardross Farm Shop offer a vast array of local and more exotic produce. But if you would rather dine out, there’s a range of award- winning eateries. We ventured up the coast to The Seafood Restaurant at St Monans, named Speciality Restaurant of the Year 2008 in the Scottish Restaurant Awards. The harbour setting is beautiful and so is the food. The dived scallops followed by sea bream – plus the Mull cheddar souffle – meant I almost didn’t have room for the chocolate and lavender tart.Our East Neuk stay was all too brief and as we headed back across the Forth Road Bridge, Ava asked when we would be back. Soon, we told her, soon.Belcote Cottage has short breaks from £300-£400. For more details visit www. elie-cottage.co.uk. For The Seafood Resaurant, St Monans, go to www. theseafoodrestaurant.com “We lit our paper lantern and watched it drift over the firth whilst darkness cloaked the Lothian hills to the south. In a straight line Elie is only 15 miles from our Edinburgh home but as my daughter Ava and I stood on this deserted East Neuk beach and gazed into the night, we were in a world of our own. If you are staying at Elie Cottage (or any other Elie self catering) and a fan of fine food and wine then a night out at Sangsters is must do. Just a stone’s throw back from the beach in the centre of Elie High Street, Bruce Sangster’s eponymous restaurant feels like a cross between a Scottish front lounge and a French auberge. Bruce works tirelessly to create inventive, taste driven dishes, while his wife Jacqueline attentively looks after front of house. Menus are fixed price and refreshingly to the point. The cooking is sharp, modern and precise – with starters such as twice-baked cheese soufflé made with Isle of Mull Cheddar or Ross-shire scallops with a oriental hit of chilli, ginger, galangal and coriander. Mains include Scotch beef fillet with red cabbage compote, onion marmalade and potato gratin or North Sea halibut with creamed leeks, bacon and vermouth sauce, and for desserts, think caramelised apple pastry with Calvados custard and apple sorbet or a tasting of oranges involving parfait, salad, crisp and Cointreau syrup. The array of dishes, which is usually three choices to each course, changes every three or four days as the menu evolves with the seasons. Booking is essential at any time especially if you are Fife self catering . Click here to go to contact. It’s the essence of summer: a good pint in the beautiful gardens of a smashing little pub. Perched above the sea walls at Elie, just round the East Neuk of Fife from St Andrews, the Ship Inn has a spectacular garden, with views south across the sea towards Bass Rock and east across a crescent of butterscotch Blue Flag beach towards Earlsferry. Hit it at low tide every second Sunday and the Pimmsy buzz is fabulous fun, with the garden doubling as off-side boundary for proper white-flanelled beach cricket. Throw in the best fish and chips on the east coast, landed the same day at Anstruther, and you’ll never want a pint anywhere else again. Nick Nairn, one of six top British chefs, revealed Elie and the East Neuk of Fife to be one of the best gastro getaways for sampling local produce, browsing farmers’ markets and dining in style. The East Neuk of Fife is a long time favourite of Nick’s. “The Ship does B&B, too — but for a treat, you should stay at the Peat Inn, an iconic restaurant-with-rooms started by my hero, David Wilson, the godfather of Scottish cooking. Geoffrey Smeddle has it now and he’s doing some seriously good things with Fife-grown lamb and beef. It’s an old, whitewashed pub on a hilltop, with smoking fires and low ceilings, and the suites have just been revamped — very smart. I’ve walked all of the Fife Coastal Path, and my favourite stretch is between Lower Largo and Elie — that beach is a stunner, two straight miles of untouched sand, a bit off the beaten track. We often ramble down there across the Lundin Links golf course after a family lunch at Blacketyside Farm shop. They grow the best raspberries I’ve ever tasted, and the cafe does simple food straight off the farm — mince and tatties, that sort of thing. The road east of Elie is studded with picturesque shellfishing villages, great for a lazy drive. The fish market at Pittenweem is worth a peek, but for buying fish you won’t beat G&J Wilson, in St Monans — it sells straight from its packing shed. There’s a little smokery round the back, doing hot-smoked salmon and haddock.